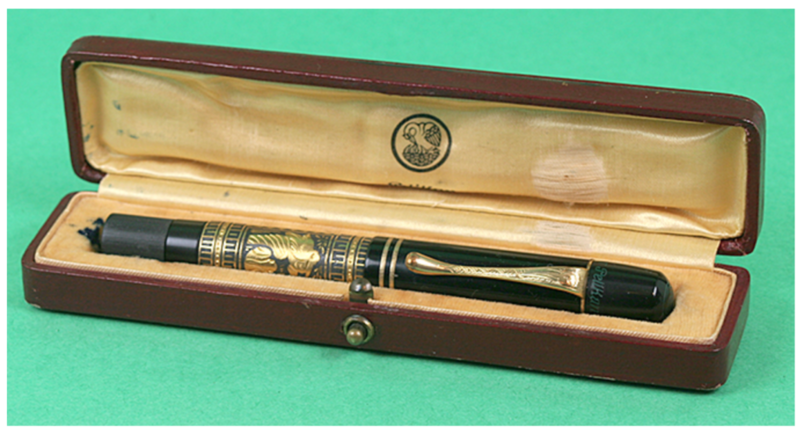 This is a 1931 Pelikan T111 Toledo piston filler in 24K gold-plated sleeve with etched pelikans surrounded by fine tooling. This is the original – not one of the modern reproductions! [Martin Lehman, author of the Pelikan book, describes the process of making the binde: the motifs of the body were carved into a relief by using a corrosive method, deep parts were then burnished, distinguished motifs were gold-plated and parts of the line drawings were then re-engraved by hand.] Black hard rubber cap with etched clip (used only on this model) and knurled cap bands (also unique to this model). Amber celluloid barrel. Fine nib. New-old-stock. Mint in original form-fitted box. 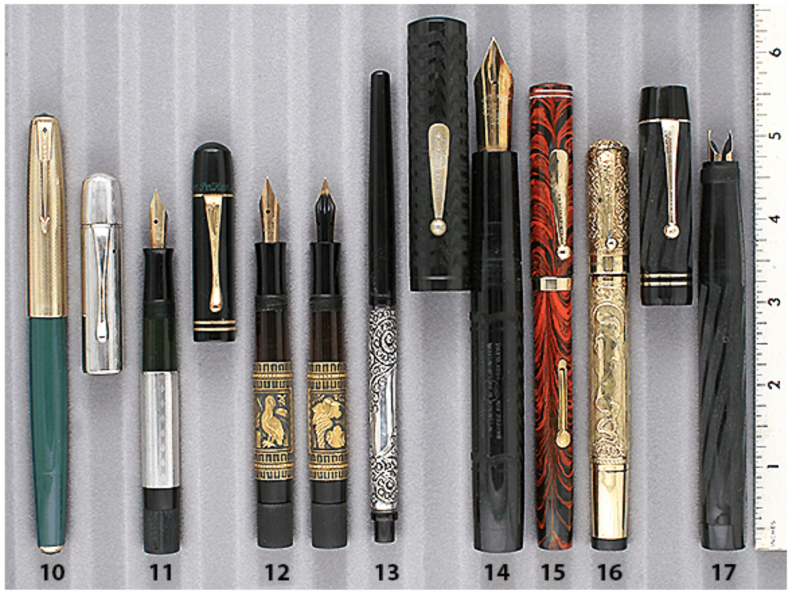 This pen is thought of as the “holy grail” of vintage Pelikans. Item #12 in Catalog #85. I wonder if you might advise me? – it is in v good condition overall, just a tad of plating loss on some of the binde key motif and braising on nib. When I received it it had a replacement cap without gold rubbed rings. I contacted Pelikan Germany and they sent me an original Pelikan cap top and a replacement cap made for the T100 in the “originals in their time series” so an exact replica. They had to re-thread it to marry to the threads on my pen. I am thinking of selling this as it’s been in the drawer for 10 years and briefly looked at once a year – I mainly collect English conways) – and would appreciate advise of how best: on eBay? Private? Through a web site? ?